My backpacking trip was a solo one. However the Pacific Crest Trail has become quite popular with books like Wild: From Lost to Found on the Pacific Crest Trail proclaiming its merits. Though I was hiking in one of the most remote wilderness areas of Washington, every day I encountered other backpackers. As I climbed away from the Suiattle River along the ridge above Vista Creek, I encountered small groups of hikers: two young men making a five-day loop around Glacier Peak and a father and daughter out for several days. 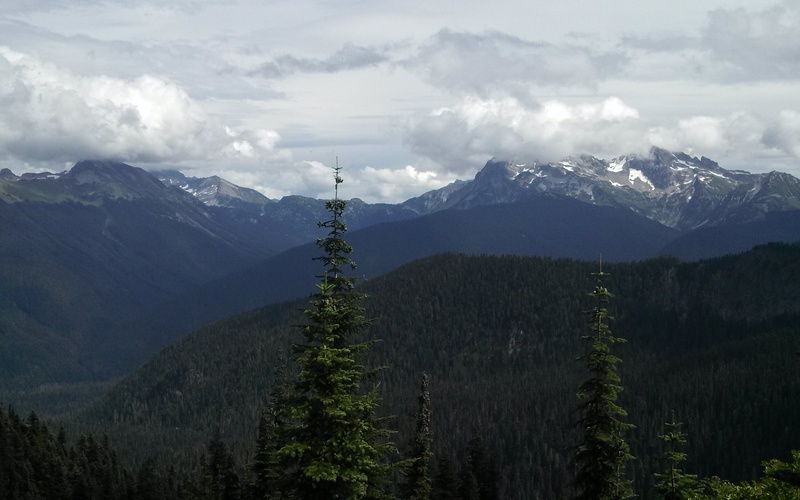 I did encounter several people who were also hiking the same section of the PCT that I was, except they were all hiking south-to-north (Steven’s Pass to Stehekin) while I was going north-to-south. From the start I was wondering when I would encounter my first through-hiker. A through-hiker on the PCT is someone who hikes the entire 2600 mile trail in one season. The most popular route is to start at the Mexican border in late April or early May and reach the Canadian border before the snow covers the trail in late September. I encountered my first through-hiker in the rain my first day. He was a young man, in his early twenties, anxious to reach Stehekin and resupply. This was the front of a long train of hikers. I discovered that most of these early pace-setters were covering 30-35 miles a day! They started at daybreak and continued to hike until it was dark. They rarely had time to stop and chat with some one going in the opposite direction. The one exception was “Lint” (trail name: through-hikers often give each other some fanciful nick-name): a tall, bearded man, who stopped to chat with me on my third day. He had hiked the PCT several times and asked me if I had stopped to eat at the bakery in Stehekin. I told him I had stopped but did not buy anything. He jokingly chastised me for “making the biggest mistake of your trip. That bakery has the best food on the whole trail and is served by only the friendliest staff. I ALWAYS stop at Stehekin.” He had slowed this day because he knew he would have to wait until Monday for the first shuttle bus; he only needed to cover 25 miles on Sunday to reach the High Bridge. That became a problem near the end of day three. The trail dropped off the ridge down into the deep valley of Milk Creek. I assumed that there would be a campsite near the bridge crossing, but discovered that there was not: the terrain was too steep. I was able to find a small level place for my tent not far up the trail. It was getting late and I had hike a tough 17 miles. As I drifted off to sleep, I was in awe of the hikers I had encountered. I was also thankful for the many gracious people I have traveled with as a follower of Jesus Christ. Jesus declared himself to be the way (John 14:6) and his way leads to many trail encounter. Who have you passed in your life journey? What have you gained in the encounter? Lord Jesus, you are the way. Thank you for our other wayfarers. This entry was posted in Uncategorized on August 31, 2013 by Pastor John Keller.